Amla is a super-fruit. It’s antioxidants are effective in reducing cell damage. It combats the aging process and leaves your skin looking younger and fresher. It has compounds that reduce the harmful build-up of free radicals in the body and also helps in releasing stress. Amla fruit promote hair growth and prevents hairfall. It also makes your hair look glossier and shinier. It can be combined with shampoo for better results. This super fruit helps retain your hair’s natural colour and prevent it from greying. Studies show that gallic acid found in amla is a powerful phenolic compound that repairs hair that has been previously damaged from chemical colouring or other environmental effect. Packed with vitamin C, Amla is exceptionally helpful in keeping your skin smooth and young. It exfoliates skin and also removes dead skin. Most popular face packs use amla as a key ingredient. You would want to say bye-bye to your parlour visits once you start using this magical powder regularly. Consuming one tablespoon of amla powder with water everyday has proved to be very beneficial for the eyesight. It also helps in curing itchy, watery, and sore eyes. All of these are advantages of amla fruit powder. Adding to the list, it also prevents and cures ulcers and gall bladder stones, purifies blood, strengthen bones and cools the body down. We are still not done with the all the benefits of this herbal supplement. 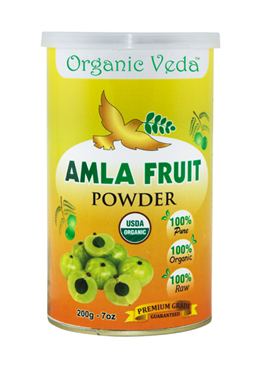 The list would go on and on but you shouldn’t wait to get this amazing Amla fruit powder for yourself.